Hempstead Town Receiver of Taxes Don Clavin has announced his winter series of taxpayer forums at local libraries. As part of his commitment to making government work effectively for the residents of the township, Clavin will discuss important issues such as assessment challenges, tax exemptions, tax discounts, property tax payment dates and convenient tax payment options. January 12- 2 p.m., Lynbrook Library, 56 Eldert St.
January 17-1 p.m., Franklin Square Public Library, 19 Lincoln Rd. January 25- 2 p.m., Oceanside Public Library, 30 Davison Ave.
January 26- 2 p.m., Levittown Library, 1 Bluegrass La. February 8- 1 p.m., Elmont Memorial Library, 700 Hempstead Tpke. February 9- 2 p.m., Baldwin Library, 2385 Grand Ave.
February 21- 2 p.m., Merrick Library, 2279 Merrick Ave.
“These forums are just another way in which Hempstead Town is doing its part to keep taxpayers informed so they do not have to pay one penny more than their fair share of taxes,” remarked Town Supervisor Kate Murray. Forums are free, and all are welcome to attend. For further information about taxpayer forums, please call the Office of the Receiver of Taxes at (516) 538-1500. “I encourage residents to attend one of the upcoming forums and learn how they might be able to reduce their property tax burdens,” concluded Clavin. Nassau County Executive Edward P. Mangano and Acting Nassau County Police Commissioner Thomas Krumpter announced today a STOP-DWI initiative that will put more police officers on the streets during the holiday season, and also announced the Holiday Free Ride Initiative supported by local taxi companies. The County Executive and Acting Police Commissioner were joined by President of All Island Transportation Larry Blessinger; Margaret Rebholz of Mothers Against Drunk Driving (MADD); and Marge Lee, Executive Director of DEDICATEDD. The “STOP DWI” program is funded by DWI fines collected in Nassau County and will provide the Nassau County Police Department (NCPD) and police departments throughout the county with additional funding that will be utilized to implement an effective DWI saturation enforcement strategy that has proven very successful in years past. The NCPD’s Highway Patrol Bureau will coordinate and plan this initiative that will target certain areas throughout the county. Since December 10th, local taxi companies have been offering free rides to those who need a ride home in an effort to deter drunk driving and prevent holiday celebrations from ending in tragedy or arrest. They will continue to offer free rides through January 1, 2012. This public service will be available throughout Nassau County and Eastern Queens by calling (516) 326-9090, and also includes rides back to the driver’s car the next day. Seven incidents have been reported in the last few weeks of persons posing as utility workers or home repair workers who have engaged in the deception/distraction technique. They lure unsuspecting homeowners away from their open doors or entice them to other areas of their home while an accomplice enters the home in search of valuables. 2 M/W stated that they were fence workers and needed to get into homeowners yard. 2 M/H Stated they were gutter repair men. F/H wandering eye stated she was a new neighbor and wanted to show homeowner work she wanted to do in the yard. Suspect was seen walking towards compact red vehicle with Florida plates. New neighbor doing work in yard. Possible left in dark minivan. Old Maroon minivan with Florida plates. 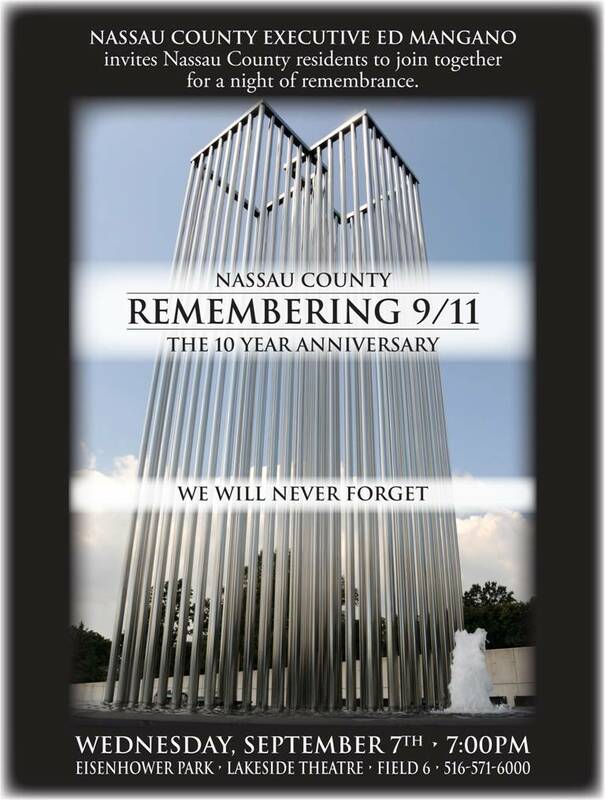 Nassau County residents are urged to dial 911 when they encounter suspicious persons and/or vehicles. Officers were working in plainclothes participating in Project 21 initiative, illegal sale of tobacco to minors. Arresting officers were present at the above business when an underage agent working for the police department entered this location and bought one pack of Marlboro Light cigarettes from the defendant. The defendant did not ask for or check the identification of this agent. Defendant placed under arrest and transported to the Fifth Precinct for processing. Officers were working in plainclothes participating in Project 21 initiative, illegal sale of tobacco to minors. Arresting officers were present at the above business when an underage agent working for the police department entered this location and bought one pack of Marlboro Light cigarettes from the defendant . The defendant did not ask for or check the identification of this agent. Defendant placed under arrest and transported to the Fifth Precinct for processing. sale of alcohol to minors. Arresting officers were present at the above business when an underage agent working for the police department entered this location and bought one 24 oz can of Coors Light from the defendant. The defendant did not ask for or check the identification of this agent. Defendant placed under arrest and transported to the Fifth Precinct for processing. County Executive Edward P. Mangano and Acting Nassau County Police Commissioner Thomas C. Krumpter and the Police Department are taking affirmative steps to ensure the safety of the people of Nassau County during the upcoming holiday season. All of our regular marked and plainclothes patrols will be intensifying their coverage of shopping malls and commercial areas. The patrols will be augmented by patrol from our Mounted Unit and Bureau of Special Operations. Concurrently, dedicated patrols have been assigned to the major malls within the county, putting additional police officers at those locations during peak hours. Plan your shopping trip carefully. Know where you are going and what routes you will take to get there. If possible, arrange for a friend to go shopping with you. There is safety in numbers. Let someone know where you are going and what route you will be taking. Additionally, let them know when you expect to return. Leave your home secure, engage alarms and give the appearance that your home is occupied by leaving the lights on in the most frequently used rooms. Don’t leave valuable items out in the open. Secure them in closets, safes, etc. Note the location of your vehicle in the parking lot to conveniently return after shopping. Always lock all your doors. Remove all items, such as radar detectors, laptops or packages and hide them in the trunk, glove compartment, out of site. Avoid parking near vans or other vehicles with covered cargo areas. Avoid carrying large handbags. Carry only what is necessary. Look around the parking lot for suspicious persons before you exit your vehicle. Don’t get out of your vehicle until you are ready. If you don’t feel safe, stay in the car or drive away. Keep your money and credit cards in your front pocket and try to limit the number of credit cards and cash you’re carrying while shopping. To avoid being a victim of “Identity Theft”, be aware of exposing credit cards, debit cards and other identification at the cash register and ATM’s. Thieves will utilize cell phones to capture card information without your knowledge. Be cognizant of any other type of “Distraction” type of crimes that typically occur during this time of the year. The Nassau County Police Department wishes everyone a safe and Happy Holiday season. Hempstead Town Supervisor Kate Murray and the town board recognized 14 extraordinary community members for contributions to their local neighborhoods at the 15th Annual "Make A Difference" Awards ceremony. "The inspirational people being honored this evening are truly the unsung heroes of our communities," said Murray. "Their selfless acts of volunteerism and leadership are true symbols of Hempstead Town and make our township such a great place to live, work and raise a family." The honorees have all dedicated themselves to enriching the lives of others. Hundreds of nominations were received for the prestigious award. Those selected, Murray noted, have quietly carried out acts of selfless generosity for many years. 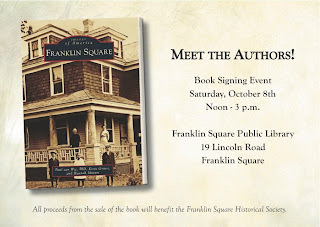 An interest in history, a yearning for knowledge and a love of their hometown combined to inspire Franklin Square residents Kiera Grassi and Hannah Mutum to pen the story of Franklin Square from the 1600s through today. Last year in pursuit of their Girl Scout Gold Awards Kiera and Hannah volunteered to assist the Franklin Square Historical Society. The duo created a photographic survey to visually record present-day Franklin Square. The project was time consuming and all encompassing, but it provided the foundation for what became a 128-page book on the history of Franklin Square. Working closely with Paul van Wie, the president of the local historical society, the girls published a literary work that has become a great source of pride within the local community. 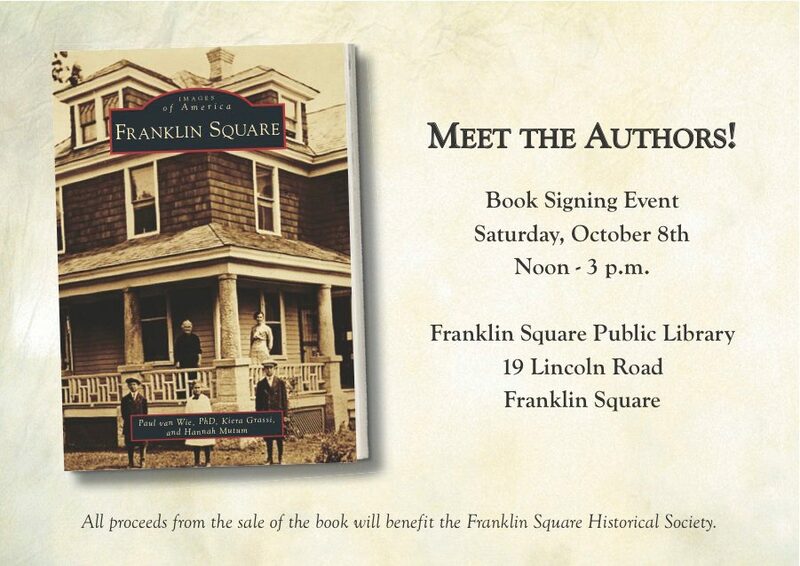 Flip through the pages of our honorees' narrative and discover the facts of George Washington's 1790 visit to Franklin Square, the community's growth as a 19th century German speaking farm community or the creation of the first-ever credit card by the Franklin Square National Bank in the early 1950s. Claudia Ledwith of Valley Stream takes her artistic talent and applies it as therapy for countless sick children and their families at North Shore University Hospital. In fact, she has devoted more than 1200 hours and donated numerous art supplies and toys over the past decade. As young patients sat listlessly with IVs attached to their arms, Claudia's art therapy helped them forget their troubles. In addition to drawing and sculpting, she plays games with the children and listens to their stories. During her time at North Shore, Claudia also took on a leadership position in which she coordinated the youth volunteer program and planned events. Claudia's art therapy brightens otherwise gloomy situations for children, which in turn, brings smiles to their faces and those of the concerned family members. "Generous, helpful, kind, caring, loyal, and thoughtful, a true gentleman, these are the words used by a dozen neighbors in describing Valley Stream resident Salvatore Spinicchia. As one neighbor says, "Sal's entire adult life has been marked by service to others." For Sal, service began as a young adult, when he fought during World War II as a member of the U.S. Army and later, as a Marine, in the Korean War. Decades later, Sal still finds himself on the front lines, only this time he's helping fellow veterans, friends and neighbors in Valley Stream, New York. Sal regularly visits war veterans, particularly those who are unemployed, to educate them on the veterans programs and benefits for which they may be eligible. Sal also exemplifies the ideals of a "good neighbor." Last winter, when neighbors had a serious fire in their home, Sal - a member of the Valley Stream Fire Department - went over and fought the flames with a fire extinguisher until fire trucks arrived. Then, Sal invited the family to stay in his home until the insurance company could make arrangements for them. Sal's standard greeting to his neighbors and friends is "Let me know if I can help." And he's backed that phrase for decades, assisting veterans, friends, family, and neighbors with a helping hand. "Our award recipients do not seek recognition, expect rewards or even look for a simple thank you. These special people just care. They care for their neighbors, their colleagues, their friends, their families and their communities," concluded Murray. "Tonight we are personally thanking them for making the world a better place." The Knights of Columbus Twelve Apostles Council #5001 has a new website. It has information about the founding of the organization , a history of our Council , a calendar of upcoming events, a list of our officers and much more. Could you post it on the Franklin Square / Garden City South / West Hempstead , North Valley Stream and Elmont Community Blog? the Website is www.kofc5001.org . On Wednesday, November 9, 2011 at 2:00 p.m.(EST),the federal government will be conducting the first nationwide test of the Emergency Alert System (EAS). The test will last up to three and a half minutes. During this period, regularly scheduled television, radio, cable, and satellite shows will be interrupted as the system is being tested. This system test is the first of its kind designed to broadcast a nationwide message to the American public. In the history of the country, nothing like it has been conducted on such a level. As you may be aware, there have been tests in the past, but not of this magnitude encompassing all regions of the Nation simultaneously. The three (3) minute test will run concurrently on all radio and TV band stations exceeding the previous messages broadcast which were anywhere from a 30 second to 1 minute message. The EAS is a national alert and warning system established to enable the President of the United States to address the American public during emergencies. NOAA's National Weather Service, governors and state and local emergency authorities also use parts of the system to issue more localized emergency alerts. A national test will help federal partners and EAS participants determine the reliability of the system, as well as its effectiveness in notifying the public of emergencies and potential dangers both nationally and regionally. The test will also provide the FCC and FEMA a chance to identify improvements that need to be made to build a modernized and fully accessible Emergency Alert System. R.E.A.C.H. is a database of children and adults with cognitive disorders that make them both more likely to become a missing person and that potentially limit their ability to communicate with the police and others. • Why should I register my family member or ward with R.E.A.C.H.? R.E.A.C.H. registration will assist the police with a swift response to missing person calls. Time is CRITICAL in these incidents. With R.E.A.C.H., a missing person alert with a recent photograph will quickly be available to police officers on patrol. Planning ahead for the worst case scenario ensures that the police have comprehensive and correct information on the missing person to utilize in a targeted search. • Who can be registered in R.E.A.C.H.? Examples of individuals who are good candidates for registration in the R.E.A.C.H. registry include those affected by Alzheimer’s, dementia, autism, Down Syndrome, mental disabilities, traumatic brain injuries, etc. There is no age restriction or minimum capacity requirement for registration. • Do you need to be a Nassau County resident to register? Registration is limited to persons with a nexus to Nassau County through either residence or caregiver location (e.g. school, day program, or frequented location). • How do you register a person in R.E.A.C.H.? Call Asset Forfeiture and Intelligence at (516) 573-5775, Monday through Friday from 9:00 a.m. to 4:00 p.m., for an appointment. • How much does registration cost? • What information is included in R.E.A.C.H.? R.E.A.C.H. includes a photograph, biographical information, and other information pertinent for locating and dealing with registrants such as likely destinations and anything else we should know, e.g. does not like physical contact, non-verbal, likes trains, etc. • Do I need a recent photograph for registration? No. At registration, a police officer will take a picture of the registrant. This guarantees that the photograph we have is the most up-to-date image and is clear. • Who has access to the information included in the R.E.A.C.H. database? R.E.A.C.H. is a law enforcement-maintained and secure database that is accessible to the N.C.P.D. from both desktops and in-vehicle computers. • What information is made public in the event a registrant is missing? The photograph, along with a physical description, area missing from, and likely destinations will be released. Other personal information remains confidential. • How is R.E.A.C.H. connected to the Silver Alert system? R.E.A.C.H. is an expansion of the Silver Alert system that will assist the Police Department with a swift response to missing person calls. • Does R.E.A.C.H. have a proactive policing component? Yes. Through the R.E.A.C.H. database, police officers will be familiar with the locations where R.E.A.C.H. registrants reside in their area of patrol. This familiarization can assist with early recovery as police officers may observe registrants in unsafe areas or situations and safely return them even prior to any missing alarm being raised. R.E.A.C.H. is a searchable database. If the police come into contact with a disoriented or nonverbal person, a physical description of the subject can be run in R.E.A.C.H. to obtain a picture match. If a match is found, contact information will be available to return the adult or child home. • What should I do if a R.E.A.C.H. registrant goes missing? Call 911 immediately and inform both the operator and the police officer who responds that the missing person is registered in the R.E.A.C.H. program. Enjoy FREE crafts & spooky music in a family friendly atmosphere. Carousel rides are only $2.00 per person! Open Cockpits For Veteran's Day Weekend! Join us and sit in the cockpits of some historic aircraft such as the the TBM Avenger! Admission includes free admission to the American Airpower Museum at Republic Airport who will also be opening some of their cockpits including the the Republic P-47 Thunderbolt. Supervisor Kate Murray announced that the Town of Hempstead Department of Conservation and Waterways, in cooperation with The Riverhead Foundation for Marine Research and Preservation, will host a free seminar on Sea Turtle and Marine Mammal Strandings. The seminar will be held on Thursday, November 17th at 6 p.m. at the town's Department of Conservation and Waterways Administration Building located on Lido Boulevard in Point Lookout. "I am very pleased that the Town of Hempstead will be hosting this free seminar with the Riverhead Foundation for Marine Research and Preservation," said Hempstead Supervisor Kate Murray. "This is a great opportunity, especially for those individuals who enjoy walking the beaches during the off season, to learn what they can do to help save an animal's life." A biologist from the Riverhead Foundation will discuss the marine mammals and sea turtle species that live in the waters of Long Island. This seminar will properly instruct residents on what to do in the event that a seal, dolphin, whale or sea turtle is stranded on the beach. The seminar will focus on a phenomenon called "Sea Turtle Cold Stunning," a process that causes sea turtles to become immobile due to the dramatic decrease in water temperature. A cold-stunned sea turtle may appear to be dead, but may actually be alive. Without proper intervention, a cold stunned sea turtle will inevitably die. This lecture will review the steps one may take to help rescue cold-stunned sea turtles. "I encourage residents to join us on November 17th and learn what they can do to help save a stranded animal, while ensuring their own safety," concluded Murray. Reservations are required as space is limited. To make reservations, please e-mail volunteers@riverheadfoundation.org or call (631) 369-9840. For further information or directions, please call the Department of Conservation and Waterways at (516) 431-9200. Domestic Violence includes verbal, emotional, financial, physical and sexual abuse and transcends all economic, educational , racial and religious lines. Statistics show that 1 in 3 women will be abused during their lifetimes and an estimated 3 women are murdered each day by their partners. Many children in households where abuse occurs are abused and neglected. Examine our own attitudes about abuse. Wear a purple ribbon and make a personal pledge never to commit, condone, nor remain silent about violence against women. Nassau County Executive Edward P. Mangano announced that he has reached out to all religious leaders in Nassau County requesting they set aside a sermon in October to spread the message, “Violence is Not the Answer.” The request comes as the County Executive prepares for the Domestic Violence Awareness Ceremony to be held, Tuesday October 4th to honor and remember the victims of domestic violence. Additionally, the dome of the Theodore Roosevelt Executive and Legislative Building will be illuminated purple as part of Nassau County’s Domestic Violence Awareness campaign. It’s Fire Prevention Week. Protect your Family from Fire! What’s the best way to protect your family from fire? Be ahead of the game, of course. With more than 360,000 home fires reported in the United States in 2009, according to the nonprofit National Fire Protection Association (NFPA), your best defense is a good offense. That’s why most local fire departments team up with NFPA during the October 9-15, 2011, to let the community know: “It’s Fire Prevention Week. Protect your Family from Fire!” This year’s campaign focuses on preventing the leading causes of home fires -- cooking, heating and electrical equipment, as well as candles and smoking materials. Additionally, it urges people to protect their homes and families with life-saving technology and planning. Check with your local fire department to see if they will be hosting activities during Fire Prevention Week to promote “It’s Fire Prevention Week. Protect your Family from Fire!” Through these educational, family-oriented activities, residents can learn more about the power of prevention and available technologies to protect their own families from fire. To learn more about “It’s Fire Prevention Week. 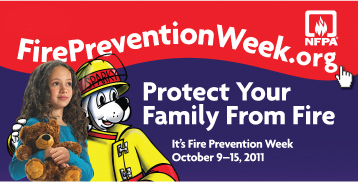 Protect your Family from Fire!” visit NFPA’s website at www.firepreventionweek.org. Taking a page from the very successful Town of Hempstead Child Identification Program, Supervisor Kate Murray and Town Clerk Mark Bonilla today announced that the town has begun offering free identification cards for senior citizens. The town introduced the program before 75 residents at the Wantagh Senior Center. "These ID cards come not only with a person's name, description and photograph, but with detailed information on their allergies, doctor's contact data, family telephone numbers and other vital information, which can be very useful in the event of an emergency," said Murray. "We have seen great results from our Child Identification Program and we are hoping for the same for our seniors." While many seniors are certainly enjoying their golden years here in the Town of Hempstead, several of them have physical ailments that can potentially put them at risk in certain situations. In an emergency, a town Senior I.D. card may help medical technicians to quickly determine how to treat a particular person, given their allergies and other related information. This card can also be used for everyday activities: Heading to the movies? Doing some shopping? Show your Town of Hempstead Senior I.D. Card and take advantage of great discounts available to seniors. For seniors who wish to participate in the program, the Town Clerk's office will provide them with easy-to-read information forms. The data is then immediately transferred onto small, wallet-sized identification cards and a larger 8" by 8" document that may be displayed on the senior's refrigerator door. The town is providing this service for free, and no records are kept by the town once an I.D. card has been created. One of the great benefits of this program is that seniors no longer have to wait on long, slow-moving lines somewhere to get an identification card. Town Clerk staff will travel to libraries, senior centers and senior clubs to provide this service on location. It takes just a few minutes to create a Senior I.D. Card that will provide years of benefits for seniors. "We encourage our seniors in the Town of Hempstead to take advantage of this great program," said Bonilla. "It's fast, it's simple and best of all, it's free!" Supervisor Murray would like to thank Town Clerk Mark Bonilla, Department of Senior Enrichment Commissioner Johanna Scarlata, and the staff at the Wantagh Senior Center for their assistance in organizing today's event. "What's more convenient than having your personal information, physicians' contacts and emergency numbers all in the palm of your hand?" said Murray. "We in the town are happy to provide this free service for our seniors." Crime Stoppers and the Nassau County Police Department are seeking the public’s help in connection with a motor vehicle accident which occurred in Franklin Square, N.Y., within the confines of the Fifth Precinct. On Friday, August 19, 2011, at approximately 8:57 PM the female victim was struck by a gray or silver colored vehicle, possibly a Volkswagen while walking north across Hempstead Turnpike, west of Pacific Ave, Franklin Square. Operator fled scene westbound on Hempstead Turnpike without stopping and identifying himself. WASHINGTON, D.C. - LG Electronics Tianjin Appliance Co., in cooperation with the U.S. Consumer Product Safety Commission (CPSC), is urging consumers to check if they have recalled Goldstar or Comfort-Aire dehumidifiers. The firm is re-announcing the recall of about 98,000 of the dangerous dehumidifiers that pose a serious fire and burn hazard, and are believed to be responsible for more than one million dollars in property damage. Nassau County Office of Emergency Management will be conducting ground treatment for West Nile Virus. In an attempt to protect the residents of Nassau County, spraying will begin immediately. For additional information please call the West Nile Virus Treatment Hotline at 1-888-844-8657 on the days the treatment is scheduled between the hours of 0900 – 0001 hours. The US Environmental Protection Agency and the New York State Department of Environmental Conservation do not require relocating or taking special precautions during mosquito control treatment. Individuals, especially pregnant women and children, should remain inside during the treatment and for about thirty (30) minutes afterwards. In addition, individuals may minimize exposure by closing their doors and windows, turning window fans off, setting the air conditioner to maximum and re-circulate to avoid any unnecessary exposure. Keep children’s toys indoors, cover fish ponds during spraying. Keep pets indoors, as well as their food, water dishes and toys. Hempstead Town to Host Free Pet Adoption Fair, Rabies Clinic at Town Animal Shelter. Hempstead Town Supervisor Kate Murray, Town Clerk Mark Bonilla and the Town Animal Shelter will host the Adopt-a-Pet Fair and Rabies Clinic on September 24, 2011, an annual event at which town residents can adopt a pet and have it vaccinated, microchipped and spayed/neutered, all free of charge. "We're giving our residents an opportunity to find the pet of their dreams and have it vaccinated, spayed/neutered and microchipped to help keep him or her safe and healthy for life," said Murray. "You can't put a price on unconditional love. That's why, for new pet owners, we're offering these services at no charge." The event caps the town's three-month Summer of Love program, during which all pet adoption fees were waived. During the promotional period, 136 cats and 148 dogs were adopted from the Animal Shelter. The town has permanently waived fees for senior citizens, veterans, volunteer firefighters, auxiliary police officers, and the physically challenged. In addition to helping animals find homes, Hempstead Town is committed to ensuring their safety. The Town Clerk's office will be issuing licenses for dogs, which entails a modest fee of $10 for spayed or neutered animals (owner must provide spay/neuter certificate). All dogs receiving rabies vaccinations must be licensed and pre-registered, which can be done by calling the Animal Shelter at (516) 785-5220. The fee for a rabies shot is $10. Rabies vaccinations are being provided courtesy of the Long Island Veterinary Medical Association. A pet adopted at the event will receive free rabies vaccinations, microchipping and spay/neuter. New owners will only be charged for licensing their dog. Current pet owners can take advantage of these services for a modest fee. "I am proud to partner with Supervisor Murray and the Animal Shelter to provide these great services for our residents," said Bonilla. "Not only are we matching these animals with caring families, but we’re making sure they are in good health." "In a perfect world, every pet would have a home and every home would have a pet," said Cindy Iacopella, Assistant Director of the Town Animal Shelter. "Here at the Animal Shelter, we're working to find loving homes for as many of these animals as we can." Supervisor Murray would like to thank all who contributed to planning this year's event, including Town Clerk Bonilla, Town Animal Shelter staff and the Long Island Veterinary Medical Association. "We encourage all town residents to come out this Saturday and adopt a new pet," said Murray. "These animals need a loving family, and what better place for them to call home than in one of our great communities here in the Town of Hempstead!" Please join us Monday, Sept. 19, 7-9 PM, at the Welcoming Center, Winthrop Wellness Pavilion, 1300 Franklin Avenue, Garden City for a free “Teens and Prescription Drugs” seminar. Understand the signs of prescription drug abuse and prevention techniques that may save your loved one. Abuse of prescription drugs in order to “get high” ranks second among teens as the nation’s most prevalent illegal drug problem. Nancy Langdon, RN, will provide the tools to help you. Call 739-1700 to reserve your seat. Nassau County Executive Edward P. Mangano and Acting Police Commissioner Tom Krumpter held a news conference today to discuss the state of heightened awareness here in Nassau County. As a direct result of the terror threat, the NCPD has stepped up its uniformed and plain clothes patrols, especially at our train stations and shopping malls. Residents can do their part by participating in the See Something, Say Something Campaign. For example: you know your neighbors, you know the vehicles that belong on your block and in your area, if you see something suspicious, say something! If you notice any individuals who appear suspicious, such as being overdressed for the weather or hiding something under their clothes, say something! If you see unattended packages or notice strange odors, say something! If you see someone suspicious drawing diagrams or maps, using binoculars, night vision devices or taking photographs and videos in unusual places, say something! Please see the below statement issued by the county’s Department of Health and Department of public works. I will continue to keep you updated on this matter. Due to a no-fly zone imposed by the Federal Government, be advised that the aerial treatment for West Nile virus scheduled for Monday, Tuesday and Wednesday, September 12, 13 and 14 has been postponed. Please be advised that the Department of Health will be conducting aerial sprayings for West Nile Virus beginning in the evening of Monday, September 12th, weather permitting. For more information, please read the following press release from the Department of Health. Uniondale, NY - Due to the high numbers of mosquitoes, presence of West Nile virus and large quantities of standing water following unprecedented rainfall, Nassau County Departments of Health and Public Works will enact additional mosquito control measures to protect the health of the public. These control measures include the aerial application of adulticide to eliminate viral activity and decrease the mosquito population within the County. Nassau/Suffolk border to the Seaford Oyster Bay Expressway. North of the Seaford-Oyster Bay Expressway at Jericho Turnpike. Western Border: Route 106 beginning at Jericho Turnpike. South of the Seaford-Oyster Bay Expressway at Merrick Road. Western Border: Wantagh Parkway beginning at Merrick Road. Zone 1 will also include the communities of Centre Island and the Barrier Islands (Tobay Beach, Jones Beach Point Lookout, Lido Beach, Long Beach and Atlantic Beach). Alternate Date: Tuesday, September 13. Seaford Oyster Bay Expressway to the Meadowbrook Parkway. Western Border: Glen Cove Road which changes names to Brewster Street, then School Street and ending along Dosoris Lane. North of the Seaford-Oyster Bay at Jericho Turnpike. Eastern Border: Route 106 beginning at Jericho Turnpike. Alternate Date: Wednesday, September 14. North of the Meadowbrook Parkway at Glen Cove Road. Alternate Date: Thursday, September 15. Weather permitting, the planned schedule for aerial treatment will be on Monday, September 12 beginning at 7 P.M. and ending at 1 A.M., Tuesday, September 13 beginning at 7 P.M. and ending at 1 A.M and Wednesday, September 14, beginning at 7 P.M. and ending at 1 A.M.
Health Effects: The chance of experiencing any health effects from the use of Scourge to control mosquitoes is quite low. As with any pesticide, individuals may want to reduce or eliminate exposure. Some particularly sensitive individuals may possibly experience short-term effects such as eye, skin, nose or throat irritation or breathing problems. Since the effects of the aerial treatment dissipate in a few hours, it is not necessary to wash off outdoor furniture or playground equipment before use, although doing so will not diminish the effectiveness of the pesticide applied. Crime Stoppers and the Nassau County Police Department are seeking the public’s help in identifying the subject(s) wanted in connection with a robbery which occurred in Franklin Square, New York within the confines of the Fifth Precinct. 993 Hempstead Turnpike, Franklin Square, New York. A handgun was produced to forcibly steal jewelry and cash. Crime Stoppers is asking anyone who knows the identity of the subject(s) or with any information about this crime to call our toll free hotline: 1-800-244-TIPS (8477). All calls will be kept confidential. Crime Stoppers is offering a reward for information leading to an arrest. County Executive Edward P. Mangano and Acting Police Commissioner Thomas C. Krumpter are urging citizens to be vigilant when receiving unexpected mailings or other forms of solicitations that inform them that they are winners of a lottery, especially if the correspondence is from a foreign country. It has come to the attention of the Nassau County Police Department that individuals are receiving phone calls and notifications in the mail that they are winners of a sweepstakes lottery and in some instances they receive a partial bank check of the winnings that appears to be legitimate. · Don’t send money if a caller requires you send money “right now!” and that you must wire money before you can claim your prize. · Don’t wire money to someone you don’t know well. After your money is paid, you will not get it back. · Don’t send money to someone who tells you what to say to the wire transfer agent, or says you should hide information or lie to the agent. · No legitimate bank or credit card company will ask you to supply them with your social security number or bank account passwords over the telephone or on-line. · Contact your local police department if you receive one of these counterfeit lottery notifications. It’s back to school time and Nassau County Executive Edward P. Mangano and Acting Police Commissioner Thomas C. Krumpter would like to issue some school bus safety tips for students and motorists. · The most dangerous part of the school bus ride is getting on and off the school bus. · The loading and unloading area is called the "Danger Zone". · The "Danger Zone" is the area on all sides of the bus where children are in the most danger of not being seen by the driver (ten feet in front of the bus where the driver may be too high to see a child, ten feet on either side of the bus where a child may be in the driver's blind spot, and the area behind the school bus). More than half of the pedestrian fatalities in school bus-related crashes are children between 5 and 7 years old in 1999. · Studies have shown that many drivers illegally pass stopped school buses that are loading/unloading students. · Wait until the bus stops, the door opens, and the driver says its okay before stepping onto the bus. · Walk on the sidewalk or along the side of the road to a point at least five giant steps (10 feet) ahead. · Be sure the bus driver can see you, and you can see the bus driver. · Stop at the edge of the bus and look left-right-left before crossing. · Tell the bus driver if you drop something beside the bus. Should you try to pick it up, the bus driver may not see you and drive into you. · NEVER stick anything out the window -- arms, legs, head, book bags, etc. · Be aware it is illegal in every state to pass a school bus stopped to load/unload students. know and understand laws governing motorist's driving behavior near a school bus. stopped, and that children are getting on or off. Motorists MUST stop their cars. · Begin moving only when the red flashing lights are turned off, the stop arm is withdrawn and the bus begins to move. · Watch out for young people who may be thinking about getting to school, but may not be thinking about getting there safely. · Slow Down. Watch for children walking in the street, especially if there are no sidewalks in the neighborhood. Watch for children playing and gathering near bus stops. · Be Alert. Children arriving late for the bus may dart into the street without looking for traffic. 1. Never run a portable generator or portable pump inside your home, garage, or any enclosed area. Generators and Portable Pumps when running, produce deadly Carbon Monoxide. Keep running generators and portable pumps away from doorways, windows, and other building openings. 2. Never use a BBQ, Hibachi, or Portable Grill inside your home, garage, or in any enclosed space. Besides being a Fire Hazard, they produce deadly Carbon Monoxide. Both Propane and Charcoal grills produce Carbon Monoxide when in use. Cook in a well ventilated area away from your home. 3. Avoid the use of Candles for illumination during times of power outage. Candles have been responsible for several fires in Nassau County during Hurricane Irene. Open flame candle fires spread quickly, and can be deadly. Use "battery operated" flashlights and lanterns instead. 4. Never touch or go near downed power lines, or "any" metal objects near them such as fences. Approaching such areas can be deadly. 5. With extended power outage, Fire & Smoke Detection Systems in your home may no longer be operational. Be vigilant about fire safety in your home during this period. Purchase and install "battery operated" Smoke and Carbon Monoxide Detectors, and utilize them until power is restored and you are certain that your system in operational and in good working order. 6. If using power tools such as chain saws, etc. use them with "Great Care" and only if completely familiar with their operation, use, and manufacturers guidelines. Wear proper protective equipment when working with or around power tools (gloves, eye & ear protection). 7. Residents are urged to save 9-1-1 for "life threatening" emergencies only. Keeping these lines free may save a life. The Nassau County "non emergency" and "information" line for Hurricane Irene questions and issues is 1-888-684-4274.